If a trumpet and a clarinet play the same note we can still tell the difference between the two instruments. Likewise, different voices sound different even when singing the same note. Why? We now know that if they are playing or singing the same pitch the fundamental frequency is the same for both so it is not the pitch that enables us to tell the difference. These differences in the quality of the pitch are called timbre and depend on the actual shape of the wave which in turn depends on the other frequencies present and their phases. Pure tones such as from a tuning fork have a pure sine wave shape and a single frequency. However the notes from musical instruments and voices are more complex and normally contain many frequencies, as we will see in the next chapter. We will also come back to other aspects of the human perception of sounds in Chapter 10 on Perception. For now the main point is that the subjective perception of pitch, loudness and timbre are each related to more than one quantity that can be measured in the laboratory. The following diagram shows some of the connections between objective (laboratory) measurements and subjective perception. Notice that our perception of loudness is mainly determined by the intensity of the sound (energy per second per square meter) but also is influenced by frequency and waveform of the sound. Likewise our perception of pitch is mainly determined by the fundamental frequency but also influenced by intensity and waveform. Finally, timbre is determined by waveform (which is determined by the other frequencies present and their phases) with influences from intensity and the fundamental frequency. As we will see later (in a demo in class) the duration of a sound also affects how we perceive its pitch, loudness and timbre. Pitch is primarily determined by the fundamental frequency of a note. 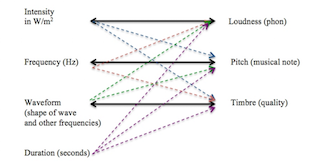 Perceived loudness is related to the intensity or energy per time per area arriving at the ear. Timbre is the quality of a musical note and is related to the other frequencies present. Laboratory instruments measure the fundamental frequency in Hz and sound intensity in W/m2 of a sound wave as independent properties. As we will see we can also measure the other frequencies present which determines the waveform. Our hearing mechanisms, on the other hand, perceive the subjective qualities of timbre, pitch and loudness of a musical note. The objectively measured quantities are related to the subjective perceptions but the relationship is not precise. For example we perceive loudness differently for different frequencies. Our ears are better at distinguishing differences in frequency (JND Hz) at low frequencies than high. And we distinguish loudness differences better for loud sounds (JND dB). As we will see there are several other interesting features of our hearing system that make the perception of sound different from measurements made in the lab. End of chapter exercises: Pitch, Loudness, Timbre. Investigate this model further by visiting its Open Source Physics webpage. © 2019, Author name; Kyle Forinash.